Last night as a part of our 12 Books of Christmas Ethan received The First Christmas book. So today I wanted to do an activity that would involve the Nativity story. 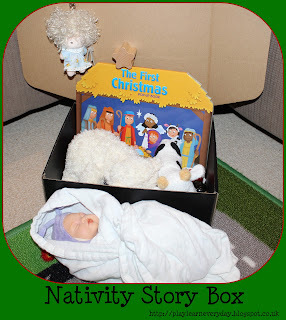 Of course I turned to Pinterest and I found the Sensory Nativity Story Box idea on The Fairy and the Frog website. She had a lot of fantastic stuff in her story box, I only did a small version with an angel, a star, a cow, a sheep and a baby wrapped in a muslin. It was a fantastic opportunity to reread the story to Ethan showing him the props as we went along. We haven't done this before, but it is a fantastic activity for developing Communication, Language and Literacy by making the story come to life. It is also reinforcing the Christmas story to him and making the connection to what we are celebrating, which is a part of his Personal, Social and Emotional Development.